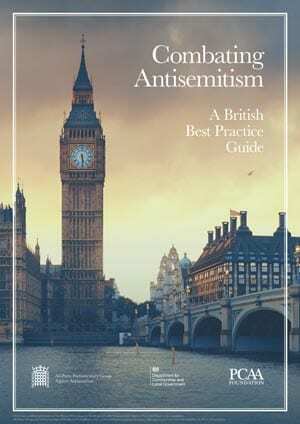 Antisemitism Policy Trust publications can be found on this page, however the Trust has helped to deliver all of the cross-party reports produced by the All-Party Parliamentary Group Against Antisemitism. These can be found on the APPG Publications page. What can the internet tell us about antisemitism in the United Kingdom? 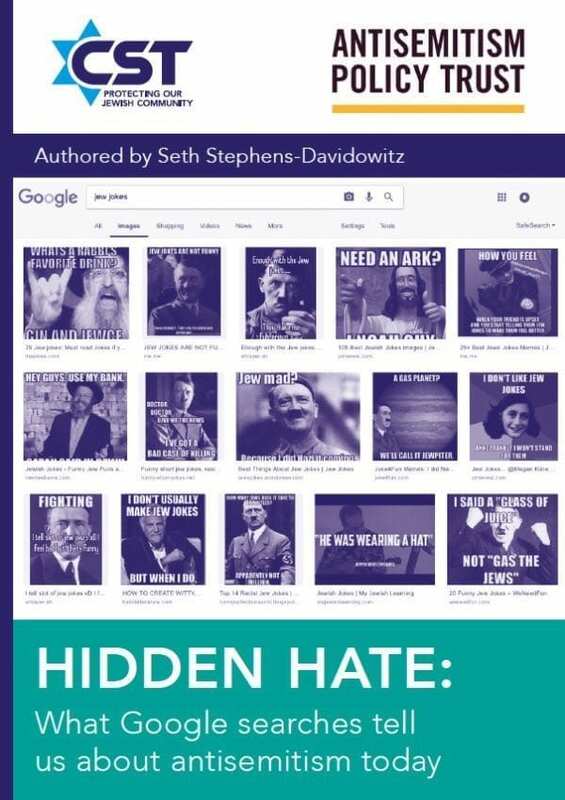 The Antisemitism Policy Trust together with the Community Security Trust have published a new report, called Hidden Hate: What Google searches tell us about antisemitism today, that uses Google search data from 2004 to 2018 to show what people in the UK are searching for in relation to Jews, Zionism and the Holocaust, and what this tells us about antisemitic attitudes in Britain. The report also uses data from the complete archive of the far right website Stormfront, which has been used as a discussion board by neo-Nazis across the world for over 20 years. The report is authored by Seth Stephens-Davidowitz, who wrote the acclaimed 2017 book Everybody Lies: What the Internet Can Tell Us About Who We Really Are. This briefing is intended to provide an overview of the definition, manifestation and prevalence of anti-Jewish hatred. 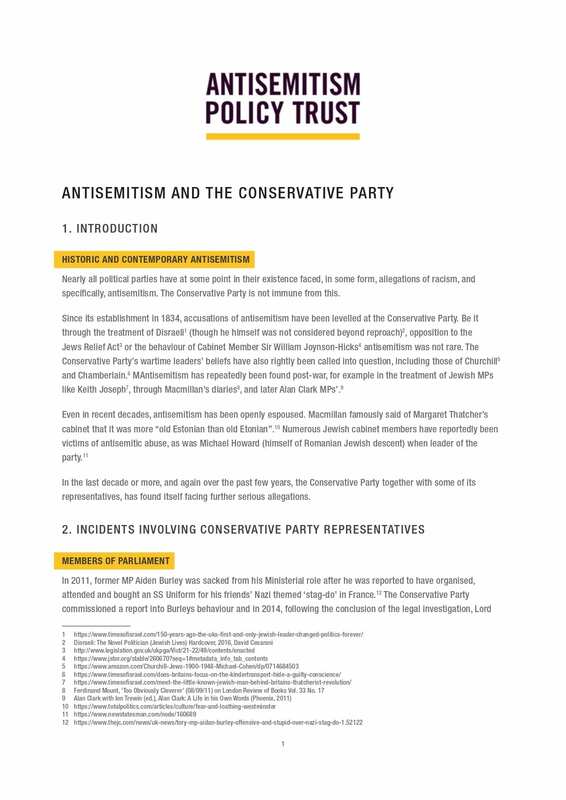 This briefing provides detailed examples of historic and contemporary antisemitism within the Conservative Party and is one of a number of briefings produced by the Trust about antisemitism in all political parties. This briefing is version 2, published on 20 March 2019. 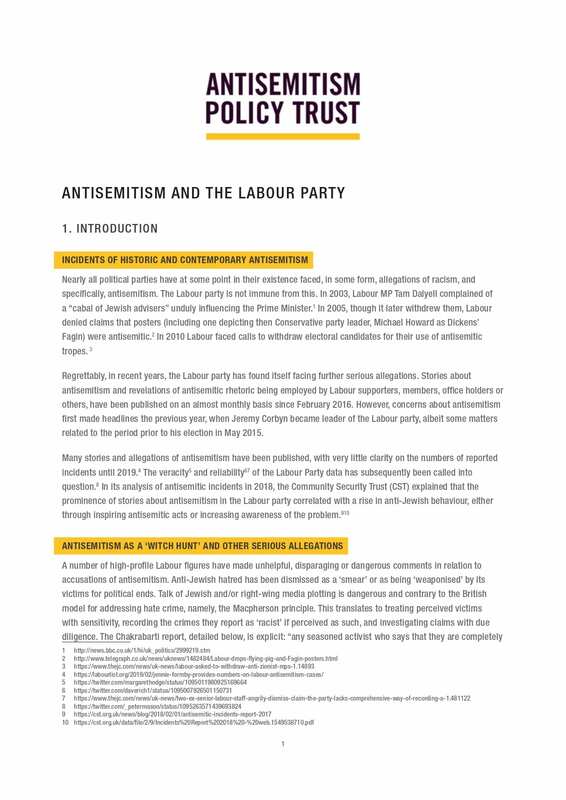 This briefing provides detailed examples of historic and contemporary antisemitism within the Labour Party and is one of a number of briefings produced by the Trust about antisemitism in all political parties. 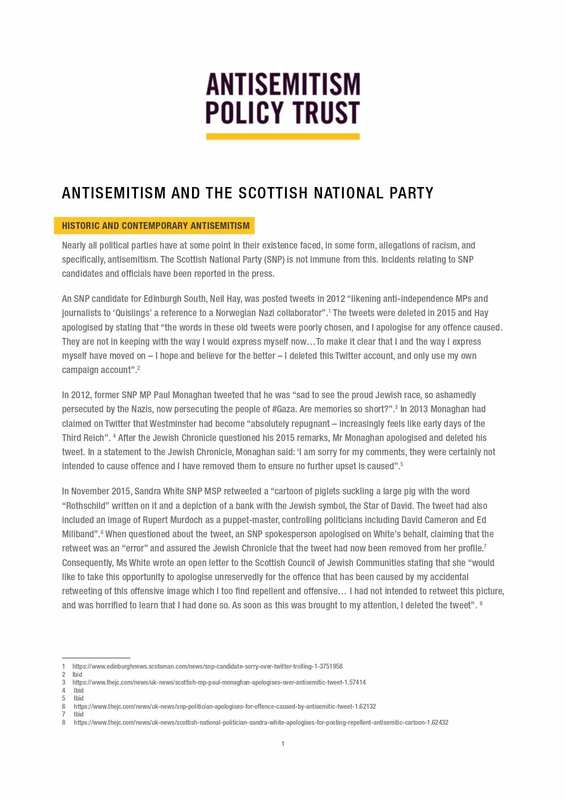 This briefing provides detailed examples of historic and contemporary antisemitism within the Scottish National Party and is one of a number of briefings produced by the Trust about antisemitism in all political parties. This briefing is version 1, published on 21 March 2019. 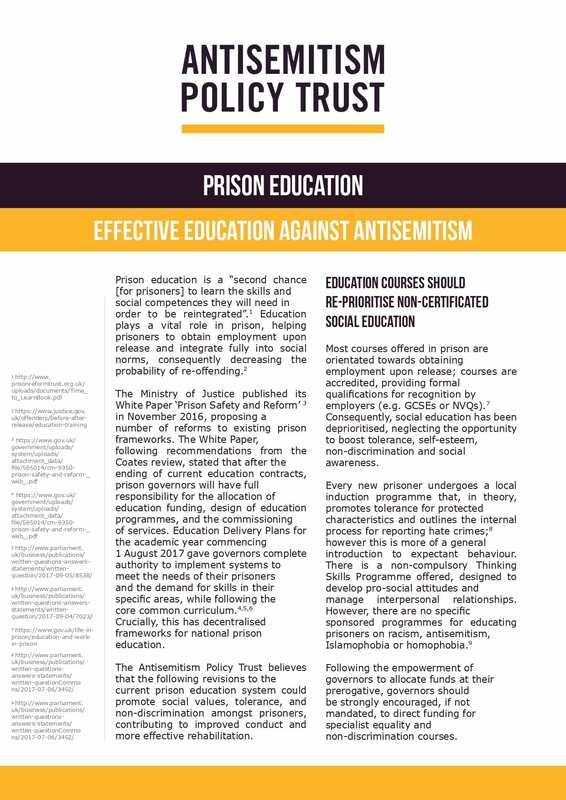 The Antisemitism Policy Trust believes that revisions to the current prison education system could promote social values, tolerance, and non-discrimination amongst prisoners, contributing to improved conduct and more effective rehabilitation. This briefing paper sets out some of the Trust's recommended actions. 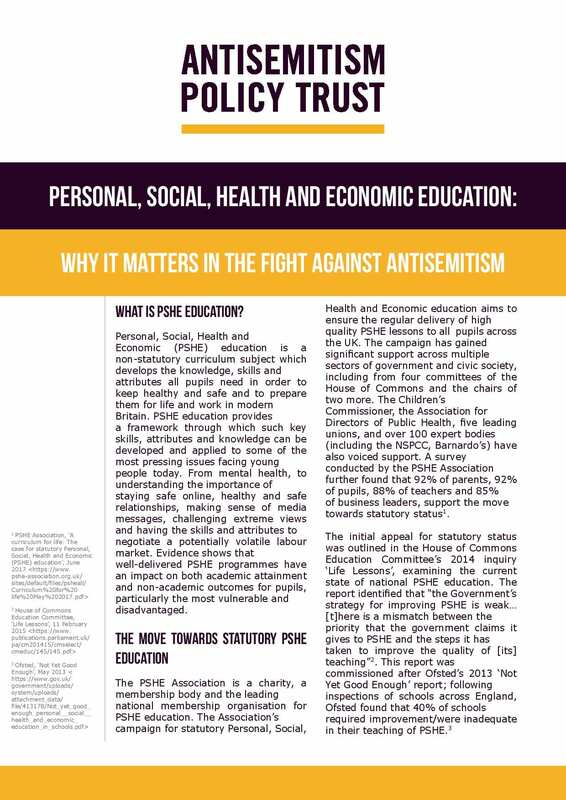 Statutory PSHE education could provide the necessary platform to ensure effective education about antisemitism and other forms of discrimination. This briefing sets out the Antisemitism Policy Trust position on improving anti-racism education. This report sets out the British experience of Parliament, Government and Civil Society working together to combat antisemitism. The guide includes key findings and various recommendations for other parliaments or governments that are seeking to improve their own efforts to combat antisemitism. It was drafted in part by the PCAA Foundation, the forerunner to the Antisemitism Policy Trust.